It’s another post for The Pagan Experience! Wk 2- October 12: Ancestors. Who are your ancestors? How do you honour them? What will you leave as your legacy as you become the Ancestor? I love working with my ancestors. It’s a part of Druidry that I have really embraced as part of my own path. Within my immediate ancestry, I’m lucky in that both my parents are still here. I’ve also been lucky enough to be able to have a long-lasting relationship with all four grandparents, and one great-grandparent – I was 10 when I lost my great-nan and I was 23 when I lost my first grandparent. I 30 when my second passed over, and earlier this month (7th October) marked the 1 year of his diagnosis, and the first birthday of his we haven’t gotten to celebrate with him. I am a “mongrel” settler-Australian as depending on what side of the family you look at I range from 2nd to 8th generation Australian. My ancestry is primarily Dutch, English, Welsh, Scottish, and Irish. I’ve never been to the UK or the Netherlands, but one day once I’ve finished my university degree I’ll get myself over there. Oma is my Dutch great-grandmother and I primarily work with her and my Opa. Apparently I’ve inherited my Medium abilities from her, and I’m so very honoured. I was 19 when I met my Oma through a Psychic Artist without realising who she was or what she was trying to tell me, and somewhere in high school when I first saw a photo of her. 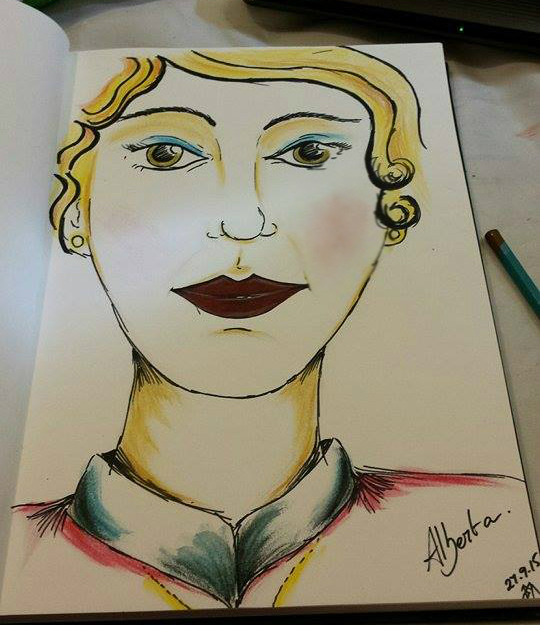 My own spirit drawing of Oma. Apparently I’ve drawn her like this a few times but I have no memory of it! My ancestors were hard workers. They were prisoners of war, revolutionaries, and members of the Resistance. They were married too young, subjected to trips on boats sailing to a new land where some of their family members didn’t make it. They were scoundrels and convicts, literate and illiterate, but they did what they had to do to make ends meet. Some died too young, some died in their 90s. They were spiritual, Catholic, Protestant, and I believe some where even really REALLY God-fearing. How do you honour them? I have candles set aside for each side of the family (ie. one of my mother’s side, one for my father’s side). For Oma I have a special candle that she chose, with a beautiful floral scent. When the candle is finished the holder becomes a pot and I have seeds ready to be planted in it. I talk to her the most often, and usually as if we’re just on the phone having a conversation. I love communicating with them in that manner because of that human element – we’re just on the phone, having a chat, and through hanging up the phone we’re ending the connection. What will you leave as your legacy as you become the Ancestor? I know how I’m going to die – I’ve seen it and I’m quite happy with it. It’s in hospital and before my Muggle passes, and from the age of two particular people at the foot of my bed I have an idea of how old I’ll be. I know that I’ll be passing on my spiritual abilities to future generations, even if they skip two like what has happened with my Oma and myself (although I can’t speak for my Dutch cousins as I don’t know them). As to what I’ll leave as I become an Ancestor, I don’t know. I really can’t answer that as there are pieces in play that I cannot mention in such an open arena such as this blog. Deep down, I know what I’ll be leaving behind, but I simply cannot post it here. Hi Cara, I don’t normally write personal stuff on the web but you show me there is no risk in doing it. My ancestors are beacons to me, showing me that I am valid and that I can do whatever I must. I did my best to raise two girls who had confidence but my inlaws want to obliterate me from their lives. All I have is the hope that I did a good enough job to be remembered by them.